Such limitations, and pressure from activists resulted in the birth of Pro-Test Israel earlier this year. The former Environment Minister, Gilad Ardan, added regulations to prevent the export of primates for biomedical research, claiming that such experiments were immoral. Activist pressure in 2012 had already forced Israel’s largest airline, El Al, to stop transporting primates for research, and they have since refused to carry any animals involved in medical research – to the detriment of patients worldwide. Perhaps most concerning was the comment by Professor Dan Shechtman, who said: “Animal rights organizations forced us to write this letter to the Prime Minister”. It is definitely worrying when a countries top academics feel the need to publish a letter to the Prime Minister expressing their concerns about the direction of research in their country. The following is a translation from the original Hebrew letter (pictured above). 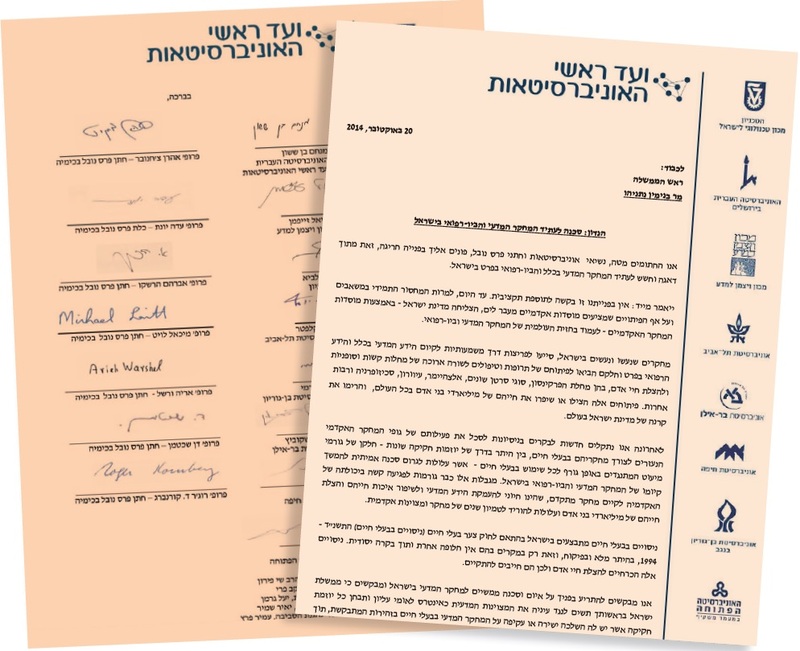 We, the undersigned, Presidents of the Israeli universities and Nobel laureates, write to you in an unusual way and out of concern and fear for the future of the scientific research in genera1l, and specifically biomedical research in Israel. We want to state clearly that we are not asking you for any additional budget. Until today, despite smaller budgets compared with those offered by academic institutes in other countries, the academic research institutes of the state of Israel manage to be at the front line of scientific and biomedical research worldwide. Research in Israel has lead to significant breakthroughs in the scientific and biomedical knowledge and some of them have led to the development of drugs and treatments for incurable and chronic diseases such as Parkinson’s, cancers, Alzheimer’s, blindness, schizophrenia and many other diseases. Those treatments and drugs save the lives and improve the quality of life of billions of people and makes Israel’s science renowned across the world. Lately we see attempts almost every day to block the activity of the Israeli academic research institutes that use animals in their research. These attempts include legislation aimed at blocking such research. This is done by a loud minority which opposes any kind of animal use and now threatens the existence of the scientific and biomedical research in Israel. The limitations now put in place are already creating difficulties for researchers in Israel to conduct advanced research which is critical for the scientific knowledge that can save the lives of billions of people and improves their life quality. Such limitations can lead to the destruction of many years of research and academic achievement. Research with animals is carried out in Israel according Israeli’s Animal Welfare (Experiments on Animals) Act, 1994. Research is done only with a specific permit and supervision, and only if no non-animal alternative is viable. Such research is essential to save human lives and that why it must continue. We would like to warn you that scientific research in Israel is in a real danger. We ask you and your government to prioritize scientific excellence in the national interest and to examine each new legislation which might have direct or indirect effects on research in consultation with the relevant experts in the field, so that we can allow the necessary conditions to allow scientific research in Israel remain at the forefront of the international scientific community. 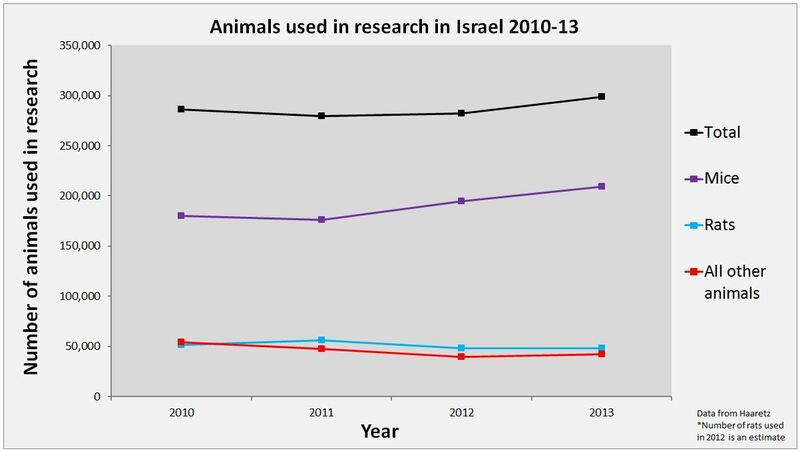 Israel publishes its animal research statistics annually. In 2013, researchers used 299,144 animals of which 86% were mice and rats. 80% of the research is conducted in the universities and research institutions – the majority of which are represented in the letter to Benjamin Netanyahu. Posted on November 4, 2014 November 4, 2014 by EditorPosted in NewsTagged benjamin netanyahu, israel, Israeli animal experiments, Nobel Prize Laureates. I have to say that the claim in the above translated letter is a bit bold and I would say untrue, or was I asleep when the cure all effective drug or treatment was discovered by theses scientists in Israel for as I quote: “Research in Israel has lead to significant breakthroughs in the scientific and biomedical knowledge and some of them have led to the development of drugs and treatments for incurable and chronic diseases such as Parkinson’s, cancers, Alzheimer’s, blindness, schizophrenia and many other diseases”. It is now 2015 and still no nearer to finding those magical cures, especially for Cancer and Alzheimer’s, despite how many animals sacrificed on the alter of human interest and benefit. On the contrary,I think that there is an ever growing number of citizens who are waking up to the immorality of using animals in research and testing, and people with this view are not in the minority any more. The thing that really is not being looked at as a consequence of finding cures and living longer, and overcoming certain diseases, is the impact on the world and our day to day lives.We have already got an overpopulated world, a lack of the infrastructure in place to look after the aging population we do have, let alone extend life even more. What is the end game her of scientists ? Is it to reach a state of being able to have a cure for everything, thereby making us virtually indestructible ? That governments are having to cut back on money for local authorities to spend on its citizens care and welfare, whether that be age health /related,disability,mental health, there is not adequate care and attention in place for people with problems as it is right now. We need to really think about why scientists believe that they have to continually strive to be better and better at the next thing and also why they have to ‘justify’ what they already know is a sordid and morally unacceptable business of using other living species to improve our lot on this planet, without their permission of course. The ‘we are human beings and better than any other living thing on earth’ arrogance that goes along with this is unbelievable. I think the most frightening thing is that scientists such as the like of Juan Carlos Marvizon, with his mindset and beliefs and is very clear on what the status of an animal is compared to us, is horrific. No I am not an animal activist, just a normal human being with the full human quota of human qualities, such as empathy,sympathy,compassion,and healthy respect of the world and the creatures that have every right to live on this planet without the threat of humans using them for their own ends and interests. There is unlikely ever to be a single magic-bullet cure for cancer – mainly because cancer is a whole range of diseases, not just one. However, for most cancers it is something most people can live with, rather than die from thanks to a whole range of medicines made possible by animal research. Prostate cancer has gone from a 25% 10-year survival rate to 84% in the last 30 years, breast cancer has risen from 35% to 75%. Drugs like Tamoxifen and Herceptin, as well as chemotherapy and other anti-cancer drugs, are changing people’s lives for the better. Many Parkinson’s patients can thank animals for treatments like L-Dopa and Deep Brain Stimulation. We may not have found cures, but we are greatly improving the lives of people with these conditions. Ultimately scientists are in the job of improving human welfare – you may disagree with that and say we should leave the old to suffer and die – I disagree, and I’m sure most other people do too. Low level ministers as Gilad Ardan and Amir Petetz are doing everything to please small groups of AR. Brain research in Israel which was one of our best research are is now standing in front of a dead end . Prime minister need to wake up !!!! !